Seen through the eyes of a squad of American soldiers, the story begins with World War II's historic D-Day invasion, then moves beyond the beach as the men embark on a dangerous special mission. Captain John Miller (Tom Hanks) must take his men behind enemy lines to find Private James Ryan, whose three brothers have been killed in combat. Faced with impossible odds, the men question their orders. Why are eight men risking their lives to save just on? Surrounded by the brutal realities of war, each man searches for his own answer--and the strength to triumph over an uncertain future with honor, decency and courage. 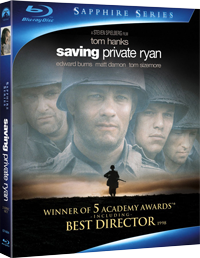 The bonus features on the Saving Private Ryan Blu-ray are largely the same as those from the D-Day 60th Anniversary Edition DVD, with the addition of the Shooting War documenatary. No new content has been created for the Blu-ray release.